ver the past several months I’ve been immersing myself in writers groups and had the joy of working with some great CP’s (critique partners). I can’t believe how many other romance writers have stepped forward out of the goodness of their heart to help take this poor, novice writer under their wing. One CP recently told me based on my synopsis that my story was “too big”. Too many moving elements. Too much going on. She gave me some hard (but much needed) advice. My husband who has held my hand and dried my tears along this journey agreed with her. But I’ve had this story like it is for so long! I whine. I don’t want to change it. Beta’s said it was great and they loved it! Why should I change it now? Nope. Not listening. So I did what any sensible person would do. I dug my egotistical heels in and plugged my ears. Then, after the dust settled and I picked myself up off the floor. I really started to look at things objectively. I sat down with my husband (the most patient man on the planet). We printed out my synopsis and highlighted each subplot in my novel. It was like an acid trip on paper. Ok. So maybe, just maybe my story IS too big. So after a week of sulking (and total avoidance), I dug in–knowing what I needed to do. This included taking out a sub plot that didn’t advance the storyline. It was really convoluted with a lackluster ending. This also included (gulp) removing pages and pages of a SC that I LOVE LOVE LOVE. That was hard for me. Killing my darling Blaze. Don’t worry readers, you will still get plenty of Blaze in book two. I promise, he’s worth the wait. This deleted so much I was able to go in and add in some deleted scenes and backstory that I absolutely loved. This in fact made the romance between Scott and Tori that much stronger. Also, I had the dreaded cliffhanger. I LOVED this cliffhanger. It was so cheeky and creative. I had been holding onto it with a death grip. I had to step back and ask myself: Am I really delivering my readers a satisfying ending? Was this cliffhanger going to look like a only marketing ploy to sell more books? I didn’t want readers to think that I was tricking them into a sequel. I honestly just had so much more story to tell and it had to end SOMEWHERE. So, I rewrote my ending. You know what? I LOVED it. As hard as it was to let go of that ending that I’ve had for five years, it felt RIGHT. As hard as it was to delete all those scenes with my SC, it too felt right. Yeah. It’s time to hire a professional editor. Let me just rub my magic lamp and ask the genie to give me the cash for that. 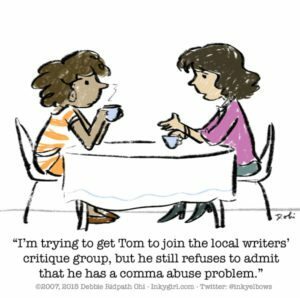 So, dear writers, listen to your CP’s. Be willing to have an open heart and an open mind. Allow your feelings to get hurt. Allow yourself to cry over it, but only for a moment. Then do what needs done. Dust yourself up off the floor and get at it. 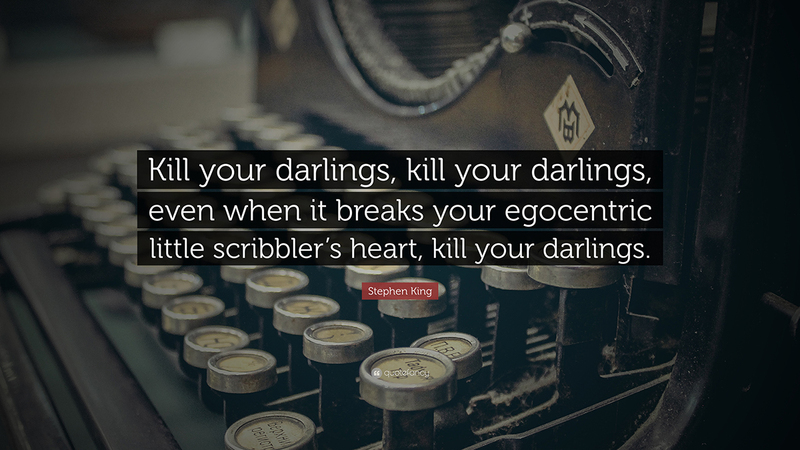 Kill your darling. Even when it (like the quote says) “breaks your egocentric little heart.” Slice it. Dice it. Chop it up and put it back together again. I’m just a flawed woman, hacking away at my laptop into the wee hours of the night, writing stories about imperfect people learning to love. 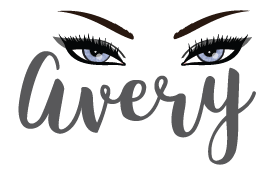 Share book reviews and ratings with Avery, and even join a book club on Goodreads.